The PROMAT 2019 theme is “Find Your WOW” and we couldn’t agree more! Besides our giant floating Mallard duck balloon, there will be a lot of Wow at Booth S449. 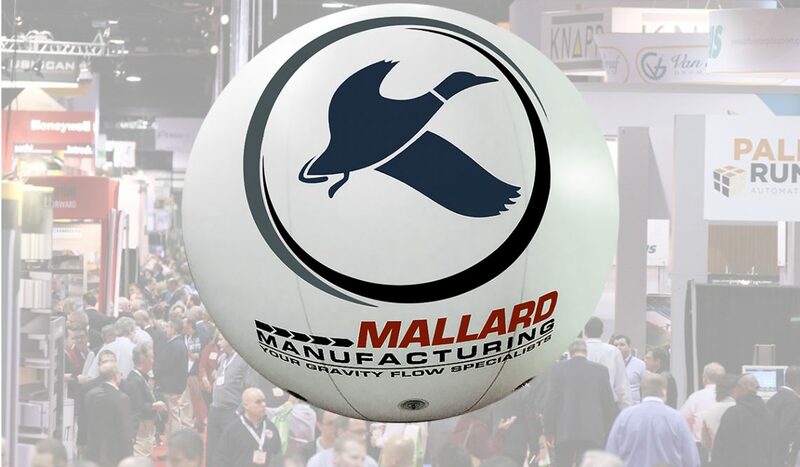 Synonyms for “Wow” include Triumph, Winner, Sensation and that’s exactly what the Mallard team offers to all our customers seeking, efficient, cost-effective gravity flow material handling solutions. Our solutions are customizable, low maintenance, easy to use and can be paired to work right alongside even the latest automated warehousing processes. Wow, right? Plus, we offer streamlined pallet storage, in-process assembly, order picking, case selection, keg and bottle storage solutions and so much more! Seasonal, perishable, whatever the inventory… Put gravity to work for you. But don’t just stop by to look at our products, we encourage our visitors to take advantage of the opportunity to speak with us about current warehousing challenges or future plans. We’re there to answer questions, formulate ideas and, yes, demonstrate the products. Pallet Separators – separate front pallets from rear pallets to relieve dangerous back pressure and improve overall efficiency. We offer a complete line of pallet separators for all your pallet flow lane design and configuration needs. It’s a lot to take in, we know, so call today to schedule an appointment to meet with one of our gravity flow specialists at your convenience during the show. That way you are guaranteed sufficient attention to your most pressing warehousing concerns right there while you’re in Chicago. Be sure to bring your plans too so we can get started right away!